Since I started leading ICT’s Brussels office in 2006, I have progressively witnessed the development of the Chinese government’s “divide and rule” strategy in Europe. This strategy tries to use the disparities among European member states to play them against each other, creating economic dependency as a tool for political leverage. Today, in light of the large amount of Chinese investment EU members states have received in recent years (and in particular in the framework of the 16+1, a structure of collaboration initiated by China together with 16 central and eastern European states – including eleven EU member states – in 2012), some European governments have become much more reluctant to criticize Beijing, including on human rights and “sensitive” issues such as Tibet. My office has regularly warned against the dangers of this strategy which undermines the EU’s position as a unified bloc, and has consistently called on member states to prioritize values over economic interest or trade relations. A highly negative consequence of Beijing’s strategy has been the cancellation of the EU-China annual Human Rights Dialogue in 2016, due to the inability of the EU member states to find a common position on China’s demand to downgrade the level of this exchange. We have cosigned a joint letter with other NGOs, calling upon EU leaders to “lead the EU and its member states in demonstrating unified and unambiguous commitment to promoting human rights in China”. 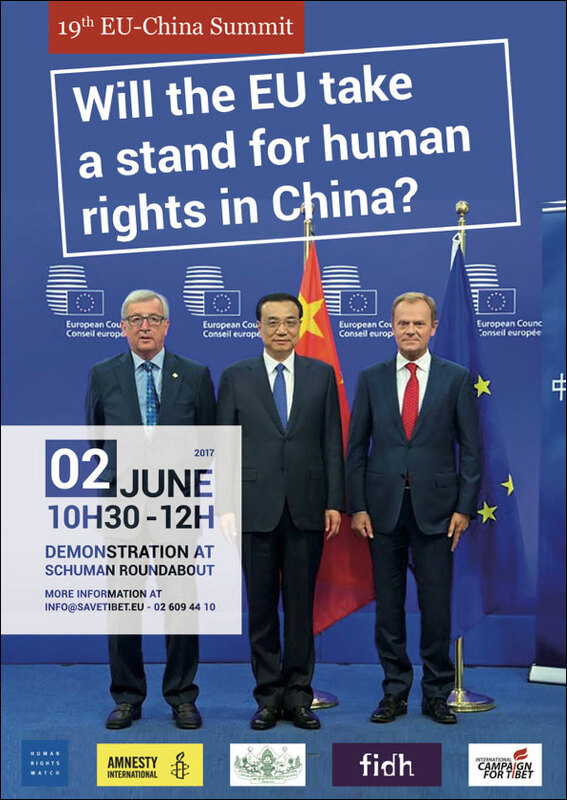 On the day of the EU-China summit on June 2 (2016), we organized, together with a coalition of NGOs, a rally in front of the EU institutions, which gathered over 200 people, including Tibetans, Uyghurs and European activists, calling on the EU to take a strong stand on the deteriorating human rights situation in the PRC. Finally, we welcomed the remarks given after the summit by the President of the European Council Donald Tusk saying that he had raised human rights issues with Prime Minister Li Keqiang including the situation of “minorities such as Tibetans and Uighurs”. It was also announced that the EU-China dialogue would finally take place – which it did, although at a downgraded level, setting an inacceptable precedent for future dialogues. The effects of the Chinese “divide and rule” strategy in Europe are now also visible at the United Nations level, as shown by the Greeks’ decision to block an EU statement critical of China’s human rights record at the 35th session of the Human Rights Council this June. This development has, in my opinion, greatly damaged the EU’s credibility as a defender of human rights and undermined its efforts toward bringing positive change in China. It prompted us to write to the Greek Minister of Foreign Affairs, reminding him of his country’s commitment to human rights and obligation to cooperate with his European partners. In addition, we have sent letters to all the other EU member states, urging them to promote EU unity on the necessity to continue highlighting China’s abysmal human rights in international fora. At the recent session of the Human Rights Council this September, the EU managed this time to deliver a statement on China’s human rights situation on behalf of all its member states, which also directly referred to the case of detained Tibetan language advocate Tashi Wangchuk. It was a relief, but the fight is far from over; as China’s political and economic influence continues to grow, more and more countries will be tempted to shy away from criticizing Beijing for fear of economic retaliation, and there will probably be other attempts to block such statements in the future. My office in Brussels, as well as other offices of the International Campaign for Tibet in Europe will therefore strengthen their efforts both at the EU and UN level to counter this divide and rule strategy. I am sure other NGOs such as Amnesty International, the International Federation for Human Rights (FIDH), or Human Rights Watch will join in. Serious questions are raised by the lecture on 4th December at EIAS by a Chinese Communist Party official who has been notable for his attempts to stifle independent debate and adherence to aggressive policies against the Dalai Lama. Vincent Metten (ICT) asking questions during the Q&A Sassion. 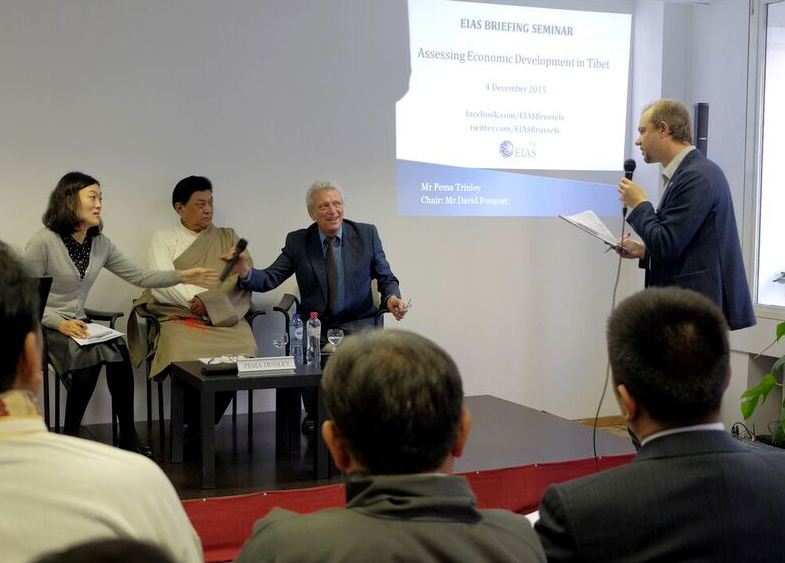 On the panel from left to right: the chinese interpreter, Mr Pema Thinley and EIAS moderator Mr Fouquet. Pema Trinley served in the People’s Liberation Army based in Tibet from 1969 to 1986, a military career which could be as an important credential for the continued implementation of harsh security policies in the region that have become the norm for the Party in handling Tibet. He is seen as a man who had played a prominent role in justifying the crackdown on Tibetans after the March 2008 protests in the Tibetan capital city, Lhasa. This year Pema Trinley accused the Dalai Lama of “profaning religion and Tibetan Buddhism” as a reaction to Dalai Lama’s remarks that he might not be reincarnated when he dies. The decision by EIAS to invite this official delegation also appears contradictory in the light of its recent decision to reject a discussion with an authoritative independent expert on Tibet’s environment, a matter of regional stability and increasing global concern. The International Campaign for Tibet (ICT) contacted the EIAS and proposed them to host an event with an expert in environmental issues in Tibet, Mr Gabriel Lafitte, a researcher in the Department of Management, Faculty of Business and Economics, of Monash University, in Australia, and editor of a specialist website www.rukor.org which focuses on Tibetan encounters with global modernity. Very surprisingly, a few weeks later we received an invitation from the same organization to attend a Briefing Seminar on Tibet by Pema Thinley as the main speaker. Participants to the EIAS Briefing. 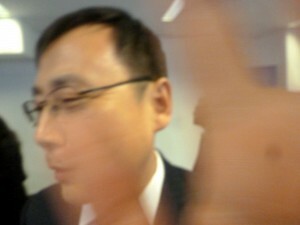 The diplomat from the Chinese EU mission trying to prevent me from taking pictures. 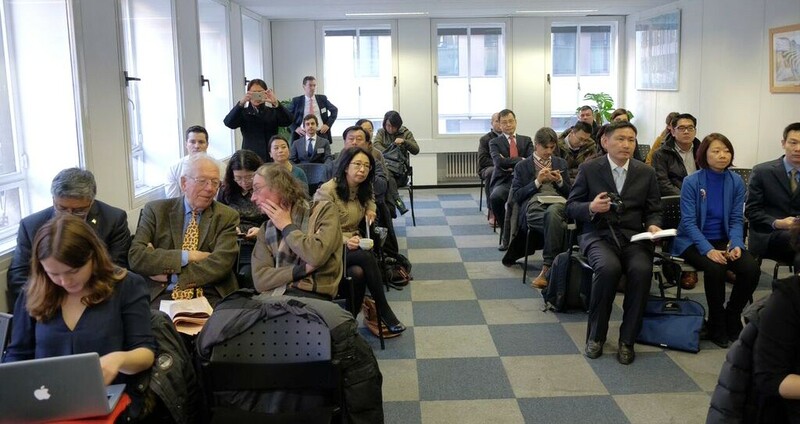 I was also quiet surprised by the attitude of a diplomat form the Chinese EU mission (the person with the pink tie) who tried to prevent me physically from taking picture during the event without any reaction from the organizers! The diplomat had forgotten his visit cards and did not mention his name to me. The EIAS did not mention publicly to all participants at the beginning of the event nor on the invitation that Chatham House rules were applying and that pictures were not allowed. Several other participants took pictures during the event without any reaction from anyone. In my view, there is a real need for additional investigation by independent experts and journalists on how some of Brussels’ based think tanks and research centers dealing with Asia, in particular active on China, position themselves and tackle sensitive issues such as human rights, Tibet, Taiwan or Hong Kong. And most importantly there is a need to understand what are the interests and reasons behind such attitudes and what is the added-value for these organisations to side-line sensitive issues from a public debate. Vincent Metten is the EU Policy Director for the International Campaign for Tibet since September 2006. Based in Brussels (Belgium), he is in particular in charge of developing and implementing advocacy strategies vis-à-vis European Union Institutions, most of European countries and the UN, in cooperation with other ICT offices. Previously he used to work four years for the European Commission as National Detached Expert in the security field (space policy and nonproliferation of weapons of mass destruction) and two years at the Office of the Belgian Minister for Defense as advisor on International Issues.